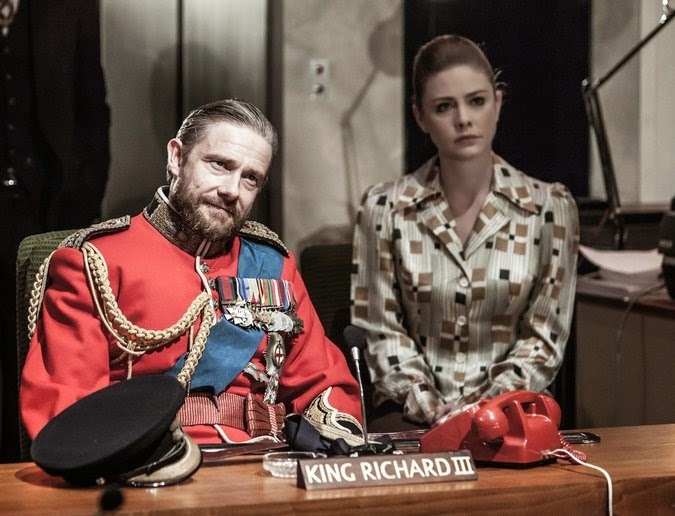 Last Friday night Stuart and I went to see Richard III at the Trafalgar Studios in London's glitzy Westminster. As part of the Trafalgar Transformed season it stars our own, our very own Martin Freeman as Shakespeare's most terrifying of psychopaths. Only this Richard we see in the manner of a persistent insurance salesman trying to sell you a policy you don’t want or need. In fact Freeman's Richard all but blends into the background in many scenes - save for the grunts while strangling a victim with a telephone cord. We have to take it as read that this man is feared throughout the realm as Freeman gives no fearful performance here. Rather he plays it as a bureaucrat - and in a comparison he would surely hate - a slightly more demonic version of Tim from The Office. Faring better was Jamie Lloyd’s production referencing as it does the UK's 1979 own so-called 'winter of discontent'. That was a time when the country seemed to be falling apart and rumours of an aristocratic plot to overthrow the Labour Party by military coup were rife. Lloyd imagines how Britain might have looked had such a coup taken place, and it is a dreary, desperate world that he sees. We visit it here in this dilapidated, linoleum-floored office, suggesting a Whitehall run to seed. Clever use is made of lifts (and lift music), old fashioned rotary telephones, cassette players, the sound of flushing toilets and an illuminated aquarium for the drowning of Richard’s brother Clarence (Mark Meadows). There are also rows of microphones, for official pronouncements and debates. With his humpback scarcely visible beneath bespoke suits and uniforms, Freeman’s Richard speaks in the measured manner of an accountant toting up numbers and looking for discrepancies in expense reports. He’s a precise, fussy little man, who when decreeing that the princes in the Tower should be despatched seems to be just tying up loose ends rather than committing such a gross act of infanticide and regicide. Freeman does find some adroitly timed and funny line readings within this repressive persona. However he lacks that hypnotic force of will that allows Richard to seduce a country, not to mention women like the doomed Lady Anne (Lauren O’Neil). It seems fitting that a later potential conquest, Elizabeth (Gina McKee), will listen to Richard’s suit only after she’s been trussed up in a chair by his henchman. That Richard requires such coercion to get an audience with a lady makes you feel rather sorry for him. His rival, Richmond (Philip Cumbus), displays more oomph. By the time he’s slain Richard and ascended to the throne, Richmond registers as twice the demented nutter that his predecessor was. So I'd say is is a good production, but not a great one.